This elegant crystal rhinestone belly chain / belt can be worn with any belly dance costume, or add it to your evening wear for a glamorous twist. This elegant crystal rhinestone belly chain / belt can be worn with any belly dance costume, or add it to your evening wear or beach wear for a glamorous twist. Approx. 41 inches long. I like seeing belly jewelry on women. I bought it for a friend and it looks great on her. The chain is adjustable allowing it drap over hips or tightening over waist. Its sturdy and nice jewelry. Haven't use the belly chain yet, but it look very nice. Q: Does this belt come in a plus size? A: Hi D. Boss, Thank you for your question. 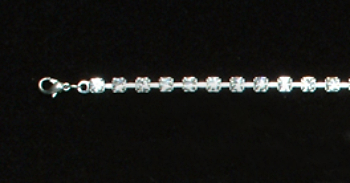 This beautiful belly chain is available in one size, and is approximately 41 inches long end to end. If you prefer it longer, you can put two of them together. I hope this helps.